In 1263, Colin Kintail, chief of the MacKenzie Clan in Scotland, saved King Alexander III by taking down a stag that attacked the monarch. In honor of Colin’s bravery, the king gifted the symbol of the 12-pointed stag to the MacKenzie Clan to use as their emblem. 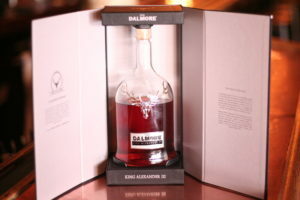 Later on, in the 1800s, the MacKenzie Clan took over the Dalmore distillery and, to this day, uses their symbol of the 12-pointed stag to represent their Clan’s history, pride, and bravery. The King Alexander III single malt scotch is one of Dalmore’s crowning achievements that begins with an aroma of red berries, passion fruit, and fresh flowers. The experience continues with a palate of citrus zest, vanilla, and caramel before finishing with sweet cinnamon and nutmeg. There’s no guarantee this particular scotch will make you brave enough to fell a charging stag, but perhaps you’ll feel brave enough to buy a glass for someone special instead. For two decades now, you’ve come in to share a conversation, the day’s news, talk about an issue, hear a poet, listen to a singer, and enjoy the finest beer and whiskey selection in town. Thank you for your years of making what goes on inside our walls interesting and unique. We’re truly a pubhouse and have sincerely enjoyed the ever-changing people and conversations. Here’s to two more decades.